Blackjack Card Counters - Wanted! The confrontation between the blackjack card counters and the gambling houses has its own rich history. The knot of contradictions is found in the following plot. The law has no restrictions for card counting systems employment. Agree that it's hard to regulate any brain activity of a person with papers and printed signs. At the same time the casino takes specific measures and obtains the private property rights allowing the house to kick any person out of the threshold. Especially the one who is cheating or using the card counting systems which are put on the same footing as fraud. Thus the gambling house owners protect their own interests and follow the rules of fair-play (according to their convictions and beliefs). In their turn the gamblers don't feel the law pressure and follow their own interests for sure - play more effectively and win more. Often by any means. It is stated that the main thing which may betray you - it's your habits. We mean betting and action habits you must employ as a principal component of the card counting systems. Thus even if you are monitored by the house you must follow some obligatory strategies and techniques or just stop being among the blackjack card counters. Also you may start playing games in online casinos and don't be disturbed at all. Now let's pass on to the list of general ways you can be caught and thrown away. At all events the blackjack card counters may be detected easily as the casinos are highly equipped and always aware of things that happen inside. Imagine your card counting technique is detected. In some cases the casino offers you flat bet option only. From that very moment you can't vary your wagers. And it's not the worst punishment you may suffer. 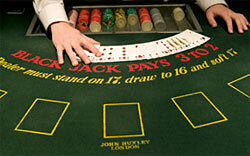 The next warning may spill over into a blackjack table ban. You will be asked to release the playing table and maybe change the activity. The most persistent blackjack card counters will be banned and released from the casino building in whole. The visit prohibition term vary significantly and may include the lifelong ban.